Produced by Erik Martensson and Magnus Henriksson. You often hear people say today’s music is forgettable and fails to inspire. When I see hard rock fans state such opinions the word ‘lazy’ immediately comes to mind… lazy because they obviously aren’t willing to put forth the effort to unearth the diamonds in an ever growing pile of manure. Don’t worry, Sleaze Roxx is here to help — we realize the casual listener’s time is extremely valuable and therefore are willing to do the dirty work for you. This brings us to Eclipse, a Swedish group that often flies under the radar yet consistently releases hard hitting melodic rock. The terms hard and melodic don’t always see eye to eye, but Eclipse has been able to successfully blend the two for years now. On their fifth studio release Armageddonize, the Swedes pick right up where the heavier direction of 2012’s Bleed & Scream left off as both albums take melodic rock to exceptional extremes. 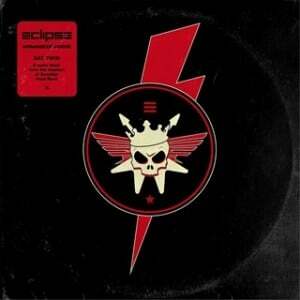 I think what really sets Eclipse apart from so many others is the rapid-fire drumming that has permeated their sound since the addition of Robban Back (check out his work on “All Die Young”), and in the process gives them that extra shot of adrenaline that is all too often lacking. Combine that with their sense of melody, walls of infectious choruses and fret-work delivered by the guitar Gods themselves, makes for one entertaining group and album. Take the opening “I Don’t Want To Say I’m Sorry” for example, it’s hard to decide if you should be head-banging along with the scorching guitars or singing the massive chorus at the top of your lungs. The song really is perfect, and if every melodic rock band showed this much energy and emotion the genre would once again become a force to be reckoned with. “Blood Enemies” is an interesting track that begins with an extended guitar intro that morphs into Whitesnake inspired metal before reigning itself back in during the chorus. Even better yet is “Wide Open”, another hard hitting composition that transforms into a true melodic sing-along during the chorus, and the swampy sounding “Breakdown”, which is a slight departure that works to perfection. Even when the group takes on a more modern approach, as can be found on “The Storm”, it works exceptionally well simply because they have absolutely mastered the art of harmony. Three of the musicians here can also be found in the critically acclaimed W.E.T., although for my money Eclipse is the real gem (although less commercially viable) between the two outstanding bands. 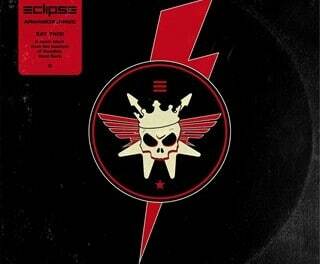 I also like the simplistic artwork that was designed to look like a slightly used vinyl album, even though Eclipse‘s sound is firmly drenched in an era ruled by compact discs. Sweden is often regarded as the home of today’s hard rock revival, and maybe Eclipse will finally get the respect and exposure that is often heaped on others from their home country — Armageddonize deserves it, and demands it!